I’m not judging you if you prefer an additive (ok, maybe a little). I’m just a fan of the basics. I do have one exception; I can be talked into a GOOD Manhattan on almost any occasion. Maybe it’s because the drink is mostly whiskey, the recipe has been around much longer than I have, or maybe, just maybe, it’s because you can’t help but feel like Don Draper in an episode of Mad Men every time you drink one. I’ve experimented with many variations of the classic Manhattan recipe by alternating combinations of bitters, vermouth, and whiskey, but it wasn’t until recently that I discovered a mysterious variation called a “Black Manhattan”. Fortunately, Columbus, Ohio is home to a handful of stellar craft cocktail bars and I was able to have one mixed up for me at the Blind Lady Tavern while visiting with a friend from the Columbus Craft Cocktail Tour. It doesn’t take much to see where the name comes from, this pic from my Instagram account shows just how dark the Black Manhattan really is (my photo is slightly filtered, but not that much). 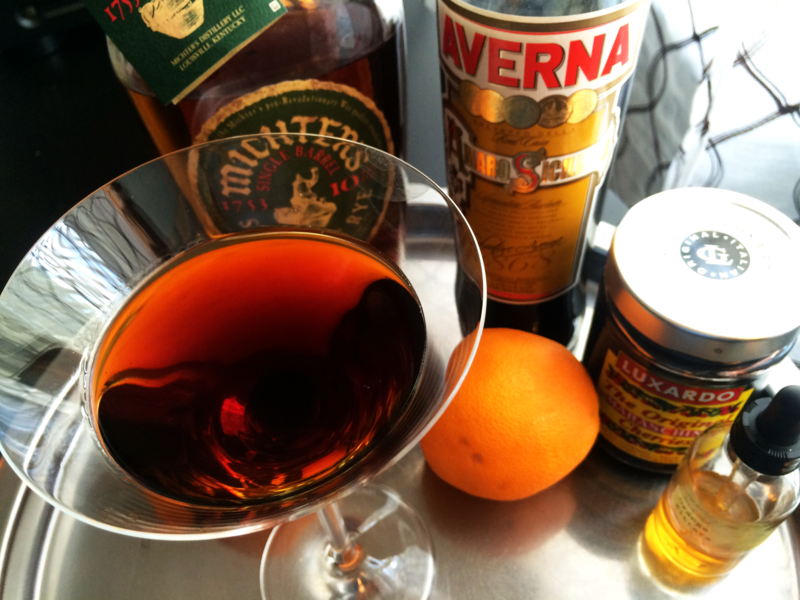 The drink’s dark and mysterious color is a result of using the Italian Liqueur “Averna” instead of Sweet Vermouth, and I have to say, I’m a huge fan of the recipe change up! So much so, that I went out the next night and purchased the ingredients to make the cocktail at home. I took a cue from the bartender, and used a few dashes of Orange Bitters from Fee Brother’s to help balance Averna’s slightly bitter taste (instead of the orange peel you saw in my pic). I put all the ingredients in a cocktail shaker, stir till the shaker gets cold, strain into a classic martini glass, then toss the cherry back in. Pretty easy right? Wrapping up, I hope you end up loving this Manhattan variation as much as I do. Let me know what you think, and please share any of your own spins on the classic Manhattan cocktail in the comments section. Thanks for this recipe! Definitely will be giving it a try.